WIN £950 worth of Thunderbolt kit from Elgato! Who doesn't like going for a Drive+? We've teamed up with Elgato to give one lucky reader £950 of stylish and speedy Thunderbolt kit in the form of a 512GB Thunderbolt Drive+ and a Thunderbolt 2 Dock (separately worth £760 and £190, respectively). 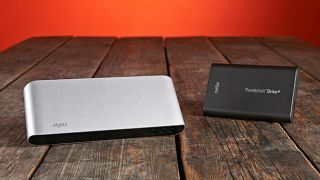 The Drive+ is a portable SSD with Thunderbolt and USB 3.0 ports, giving you speedy transfer rates of up to 420MB/second. The server-grade Plextor SSD inside it stays cool without a fan, so the drive operates silently. It's made of metal yet weighs just 270g, and it comes with a protective port cover. The Thunderbolt 2 Dock adds three USB 3.0 ports, Gigabit Ethernet, a combined microphone and headphone jack and an HDMI output to your computer. It's a great companion to a Thunderbolt-equipped laptop because all it takes to use your external devices – even a 4K display – upon returning to your desk is to plug in a single cable.